As a buy to let investor you may be frustrated that your mortgage lender is unable to let you take more than 75% loan to value (LTV) from your property. This can be particularly exasperating if you are unable to build your property portfolio further. A new concept in the UK market, buy to let equity release can present customers with solutions to realising capital from the property when other options are no longer available. Are you unable to raise capital for a deposit on another property as you are at the maximum borrowing your current lender is prepared to offer? Are you currently locked into a mortgage deal and are unable or unwilling to walk away? Do you have a need to raise capital for any reason whatsoever? 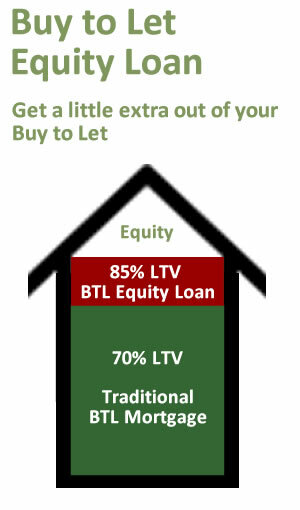 A buy to let equity release loan could be the answer. Our product will allow you to keep your existing mortgage deal in place and borrow up to 20% of the value of your property (subject to a 85% LTV maximum), you can use the money as you want and there is no obligation on you to make monthly repayments. You can keep the loan for 10 years or until you are aged 80 – whichever is the sooner. When you repay the loan you will repay the existing loan plus double the percentage you borrowed on the growth of the property since you took out the loan, subject to a minimum of just 2% per annum. OK – that sounds confusing so let’s look at a simple example. Stewart has a buy to let property worth £250,000, it is mortgaged for £182,500 (73% LTV). Stewart has seen another property that would make an ideal investment and needs a deposit of £30,000. However the maximum he can raise from his existing property is £5,000 which would take him to 75% LTV which is the maximum he can get from a standard buy to let mortgage. 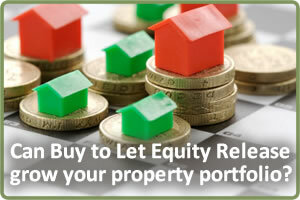 He therefore takes £30,000 using our buy to let equity release product. 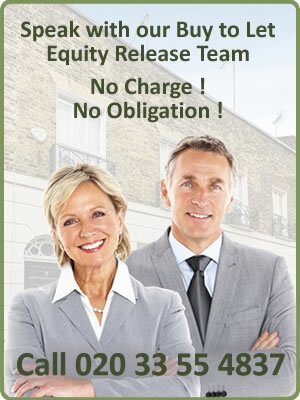 This takes his total borrowing to 85% LTV of which 12% relates to the equity release product. Stewart buys his new buy to let property. While this may seem high, Stewart feels that he has owned an additional property for 5 years and benefited from the rental income during this period, likewise he did not have to make any regular repayments on the £30,000 borrowed. Being able to borrow in this way for 5 years has left Stewart financially stronger and he has been able to repay the loan without needing to sell either of his buy to let properties, thereby preserving a long term income generating asset. While this may not be suitable for everyone, for customers in a similar situation to Stewart using our second charge buy to let equity release product could be an ideal solution. If you would like to know more about taking further capital from your buy to let property, or property portfolio, then please contact us on 020 33 55 4837 where we would be happy to provide no obligation information, help and quotes. Nothing in this article should be taken as personal advice and recommendation. UK tax rates and financial legislation are liable to change and concepts, rates, legislation and rules referred to may not be current at the time you read this article.